Last fall, the Women's Media Center celebrated a milestone marking it's 10-year anniversary during the 2015 Women's Media Center Awards ceremony held at Capitale in New York City. The event focused on honoring powerful women in media from a national and international platform as well as engaging in the conversation of the importance of the female voice and viewpoint in the global world of media. Comedian Amy Schumer opened the event with a personal, feminist speech that received a round of applause when she boldly stated, "it's good to lead by example...women can do anything they want to do." She went on to express the important role the Women's Media Center has played in changing the landscape of media and increasing representation of women: "Women's media is powerful and we need more women. The WMC is guiding a generation of women and girls into being media leaders...who are confident in telling their own stories." The Women's Media Center was founded in 2005 by Jane Fonda, Robin Morgan and Gloria Steinhem. The goal of the organization is to make women more visible in media. The WMC has forged an ongoing relationship with the media to ensure that women's realities are covered and women's voices are heard. This is accomplished by researching and monitoring media, creating and modeling original online, print and radio content in addition to training women and girls to participate in media and promoting media-experienced women experts in all fields. The organization is directly engaged with the media at every level to work toward a diverse group of women being present in the newsrooms, on air, in print and online, in film, entertainment and theatre-as sources and subjects, in bylines and credits, in the field and in the front office. The WMC has achieved many notable accomplishments over the past decade, including its annual Status of Women in the U.S. Media report, WMC SheSource, which has greatly increased the number of women experts in media, and the WMC Progressive Women's Voices media and leadership training program. This is in addition to highlighting a diverse group of women's voices and stories on WMC's nationally syndicated radio program and podcast, Women's Media Center Live with Robin Morgan and via WMC Features, WMC FBomb, the WMC Speech Project and WMC Women Under Siege. The WMC honored a group of powerhouse women in media during this past year's ceremony. WMC co-founder Robin Morgan, who presented the WMC Speaking Truth to Power Award to international prize-winning journalist Mona Eltahawy, and who hosts Women's Media Center Live, stated, "It's better than Jane and I and Gloria ever dreamed of. Ever imagined. The annual Status Report has become the go-to research on women and media." On her assessment of the progress women in media have achieved in the past ten years, Morgan states emphatically, "it's not enough- but we've made a dent. There's a consciousness about it now." 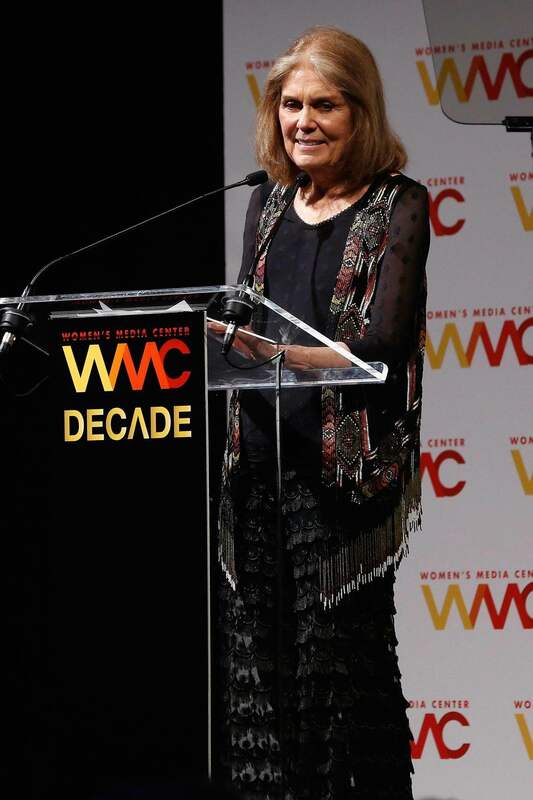 WMC co-founder Gloria Steinhem (who presented the WMC Breakthrough Media Award to her longtime friend, award-winning actress, producer, and activist Marlo Thomas) was also proud of the WMC's accomplishments, especially "all the women who feel comfortable showcasing their talent in the media who otherwise, might not have without Women's Media Center training." She added, "In a way, it's become an alternate source for all kinds of media, both traditional heritage and online media. I'm not sure there are too many other organizations that bridge those two entities completely." Carol Jenkins, the WMC's founding and former president, presented the WMC Carol Jenkins Visible and Powerful Media Award to Padmasree Warrior, former chief technology and strategy officer of Cisco Systems. Regarding the progress made in media over the past ten years, Jenkins observed, "In that decade, we got for example, two women anchors of the network news: Katie Couric at CBS and Diane Sawyer at ABC. Historic. Today those two anchor chairs have reverted to men...so holding on to progress is our next round of challenge." Pat Mitchell, the first female president of PBS, presented the WMC Pat Mitchell Lifetime Achievement Award to PBS NewsHour co-anchors Gwen Ifill and Judy Woodruff. Reflecting on the state of women's media today, Mitchell stated, "What encourages me is that everyone is taking it seriously. What's discouraging is that the numbers aren't any better....this problem of the way in which women are portrayed, and the roles that women play on screen, behind the cameras and in executive offices, is a global issue that matters." PBS co-anchor Judy Woodruff and WMC honoree observed, "It's important we have women's voices in journalism as we cover the news because we should reflect the country we're covering. We can't cover what is happening in this country-whether it has to do with the economy, education, health care, and business-unless we bring in women's voices...if we're not, then we're not fairly reflecting what the country looks like." Julie Burton, WMC President, who presented the WMC's Digital Media Award to Laura Bates, founder of the "Everyday Sexism" project, said, "We're launching the next decade with a commitment to expanding the impact and reach of all our projects...This is just the beginning. Over the next ten years, the Women's Media Center will continue to hold the media accountable for an equal voice and equal participation-and to lead many crucial conversations on gender, diversity, justice, and media." The overall tone of the evening was one of celebration for the significant impact the Women's Media Center has made in the last decade as well as recognition of the organization's continued crusade and vigilance in making sure women are represented and treated fairly in all sectors of media and that future generations are inspired to be trailblazers in this field. First Lady Michelle Obama acknowledged this crusade in a statement celebrating the Women's Media Center Awards ceremony. "I am so proud of the work [the Women's Media Center] does each and every day to champion higher standards, more accountability, and better representation of women in the media. With your advocacy and educational programs, you are opening doors of opportunity and serving as shining examples-especially for young girls-that strong, bold women can affect significant change for future generations."